BookPeople June 16th when Jenny is here to sign and discuss the novel." In a suspenseful follow-up to her critically acclaimed "Cover of Snow, " Jenny Milchman ratchets up the tension with this edge-of-your-seat story of a mother determined to find her missing children. Liz Daniels has every reason to be happy about setting off on a rare family vacation, leaving behind her remote home in the Adirondack Mountains for a while. Instead, she feels uneasy. Her children, eight-year-old Reid and six-year-old Ally, have met their paternal grandparents only a handful of times. But Liz's husband, Paul, has decided that, despite a strained relationship with his mother and father, they should visit the farm in western New York where he spent his childhood. Frantic worry and helplessness threaten to overtake Liz's mind--but in a sudden, gut-wrenching instant she realizes that it was no stranger who slipped into the hotel room that night. Someone she trusted completely has betrayed her. Though she knows that Ally and Reid are safe, Liz will stop at nothing to find them and get them back. From her guarded in-laws' unwelcoming farmhouse to the deep woods of her own hometown, Liz follows the threads of a terrible secret to uncover a hidden world created from dreams and haunted by nightmares. 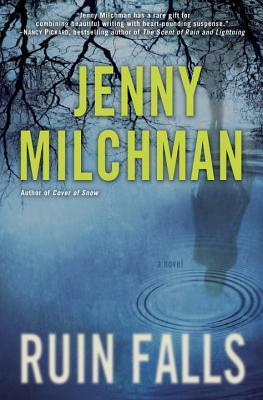 Praise for Jenny Milchman and "Ruin Falls"
" Jenny] Milchman has a gift that allows her to delve deep into the mind and psyche of her characters, and fans of dark plots like the works of Gillian Flynn will find another author to savor." --"RT Book Reviews"
"Essential for psychological thriller fanatics . . . Extreme, heart-pounding action follows this determined mother as she risks everything to save her children." --"Library Journal"
"Milchman weaves a complex and intriguing tale, adeptly pacing the narrative as danger escalates. . . . Most impressive, though, is Liz's transformation from a meek wife . . . to a strong, capable woman determined to rescue her children at any cost to herself." --"Publishers Weekly"
"Absorbing from start to finish: Jenny Milchman writes a deeply felt and suspenseful story of a woman whose life is upended by a death and a dark secret." --Nancy Pickard, bestselling author of "The Scent of Rain and Lightning"
"Milchman can evoke the shadows and fears of a rural community like no one else." --"DuJour"
Jenny Milchman lives in upstate New York with her family. She is the author of "Cover of Snow" and "Ruin Falls."